In October 2008, the Contemporary Jewish Museum in San Francisco opened an 18-month exhibition of Warhol’s Jews: Ten Portraits Reconsidered. The show, which debuted at The Jewish Museum, New York in spring 2008, was organized by guest curator Richard Meyer, a professor of art history at the University of Southern California. When Warhol’s series of prints, Ten Portraits of Jews of the Twentieth Century, was produced in the 1980s, it was met with mixed reviews. Among the questions asked was “Why would an Orthodox Catholic pop artist of dubious sexual persuasion and practices be interested in producing a series on notable Jews?” Was it simply “Jewploitation”? As one of the events accompanying the exhibition, the museum asked monologuist Josh Kornbluth if he would prepare a monologue titled: Andy Warhol: Good for the Jews? Nonetheless, the museum’s representative insists Kornbluth looks at the prints before saying no. Kornbluth agrees, not because he has any hopes for creating a new piece but because his son wants a dog, and his family lives in an apartment building that doesn’t allow animals. This gig might help them see their way to a down payment on a house and new pooch. The monologue continues, twisting its way through an elaborate series of strange segues including confrontations with a would-be suicide on a bridge, the guard at the museum who checks Kornbluth’s backpack while Josh wonders if he is carrying enough Jewish baggage, and his estranged grandparents he visits when his father lies in a coma. Interspersed are strolls through the Rembrandt Room at the Met with his dad, and Kornbluth’s individualistic interpretation of the 10 people portrayed in the prints, which includes people as diverse as Sarah Bernhardt and Franz Kafka, Louis Brandeis and the Marx Brothers, Sigmund Freud and Golda Meir. He complains that the prints don’t speak to him, that he feels there should be “something behind them.” He doesn’t elaborate what, but we sense that it is something more profound. Is it the “I and thou” of Martin Buber, the thesis subject of one of his dad’s buddies and the central philosophy of the man whose bearded, contemplative face, drawn over and colored in Warhol’s unmistakable style, is among the 10 prints? He digs deeper into the history of the prints themselves and into Warhol. 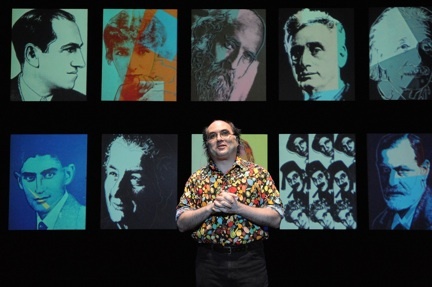 Josh Kornbluth’s Andy Warhol: Good for the Jews? extended through June 20 at The Jewish Theater in San Francisco. For tickets and information, call 415-292-1233 or visit www.tjt-sf.org.